For an African writing in English is not without its serious setbacks. He often finds himself describing situations or modes of thought which have no direct equivalent in the English way of life. Caught in that situation he can do one of two things. He can try and contain what he wants to say within the limits of conventional English or he can try to push back those limits to accommodate his ideas … I submit that those who can do the work of extending the frontiers of English so as to accommodate African thought-patterns must do it through their mastery of English and not out of innocence. Proverbs are the palm-oil with which words are eaten. "You sound as if you question the authority and the decision of the Oracle, who said he should die." "The Earth cannot punish me for obeying her mesenger," Okonkwo said. "A child's fingers are not scalded by a piece of hot yam which its mother puts into its palm." He sighed heavily, and as if in sympathy the smoldering log also sighed. And immediately Okonkwo's eyes were opened and he saw the whole matter clearly. Living fire begets cold, impotent ash. He sighed again, deeply. In the many years in which he had toiled to bring civilization to different parts of Africa he had learned a number of things. One of them was that a District Commissioner must never attend to such undignified details as cutting a hanged man from the tree. Such attention would give the natives a poor opinion of him. In the book which he planned to write he would stress that point. [...] One could almost write a whole chapter on him. Perhaps not a whole chapter but a reasonable paragraph, at any rate. You cannot plant greatness as you plant yams or maize. 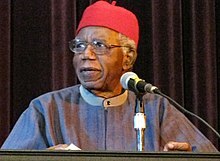 Who ever planted an iroko tree — the greatest tree in the forest? You may collect all the iroko seeds in the world, open the soil and put them there. It will be in vain. The great tree chooses where to grow and we find it there, so it is with the greatness in men.